Since starting the company from his garage in 2003, 3 Blind Mice owner Scot Dietz had been doing most of the company marketing himself, but in late 2012, decided he needed help! 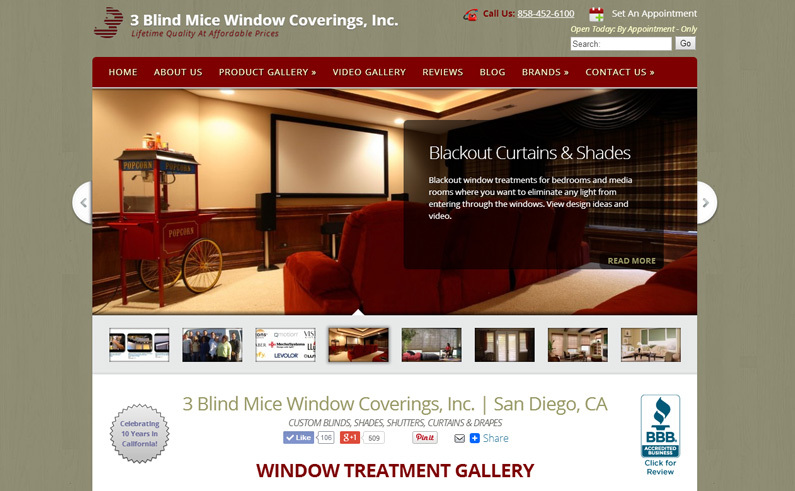 We were brought in to develop and launch a comprehensive inbound marketing strategy which included the creation of a new website, comprehensive social media presence, and targeted SEO & PPC campaigns for his San Diego blinds & shutters company. Integrated new, on-page Image Galleries & Ajax Gallery for viewing products. Integrated social media sharing including “Pin It” button on all photos. Migrated YouTube videos from Owner’s personal account to Company account. Full results coming soon, in the meantime, check out these charts showing total visits and conversions and then conversion rate vs cost-per-conversion over the last year since we took over PPC management.